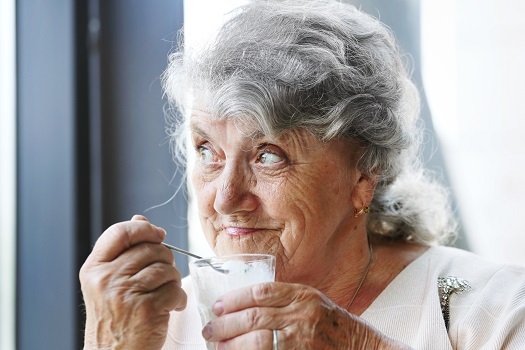 Older adults who lose all of their teeth don’t have to miss out on having a healthy diet. Many soft foods are just as tasty as they are nutritious. When your senior loved one’s dental health makes eating difficult, try incorporating these foods into his or her diet. Yogurt functions well as a breakfast or snack food, and you can change the flavors by adding ingredients such as pureed fruit or honey. It’s also full of protein, which can be difficult to get into the diets of seniors who find it challenging to eat tough pieces of meat. Just be careful to choose low-fat and low-sugar yogurt to make sure the meal is as healthy as possible. Eggs are another great option for getting a serving of protein into your loved one’s meals. You can also adjust the texture of the eggs to make them easier to eat. While you can serve eggs alone, you can also add softened vegetables, such as bell peppers, to the meal in small pieces or pureed before you scramble them to add some extra nutrition and flavor. A professional caregiver with experience in preparing various types of healthy meals can be a wonderful resource for seniors with no teeth. If your elderly loved one needs help maintaining a high quality of life while aging in place, reach out to Home Care Assistance, a trusted provider of Winnipeg senior care. Our caregivers provide transportation to and from medical appointments and social events, nutritious meal preparation, assistance with daily exercise, and help with everyday tasks like bathing, grooming, and light housekeeping. Seniors on a soft-food diet sometimes get bored and start to refuse their meals. The great thing about soups is that you can constantly provide your loved one with new flavors. Try serving minestrone one night and chicken noodle the next. When making soup, remember to chop up the ingredients smaller than you would for yourself. You can also use a hand blender to make the soup even easier for your loved one to ingest. Fish is softer than most other types of meat, and it has a lot of healthy fats and protein to boost your loved one’s diet. Salmon and cod are better options for soft meat than tougher fish, such as swordfish or mahi-mahi. You’ll also want to avoid adding crunchy breading, so try a recipe that uses lemon juice or fresh herbs for seasoning. Caring for a senior loved one with specialized nutritional needs can be challenging. If you’re the primary family caregiver for a senior loved one living in Winnipeg, live-in care is available if your loved one’s health has become too difficult to manage without professional expertise. At Home Care Assistance, we take measures to help seniors prevent illness and injury by assisting with exercise and mobility, preparing nutritious meals, helping with bathing and other personal hygiene tasks, and much more. Crunchy breakfast cereals and granola may be off the menu now, but you can still help your loved one get whole grains in his or her diet. Similar to yogurt, oatmeal is a versatile dish because you can alter the flavor. Avoid adding sugar by sweetening the oats with applesauce instead. You can also make more savory oats by adding nut butter. Many of the healthiest vegetables are fairly hard in their raw forms. However, cauliflower, broccoli, and carrots all get very soft once you steam them. Try serving a steamed vegetable medley instead of a salad. Your loved one may be able to enjoy some of his or her favorite vegetables again, and you’ll love how easy they are to prepare. For seniors who don’t have teeth, getting proper nutrition can be difficult. There are a variety of age-related health conditions that can make it more challenging for seniors to live independently. However, many of the challenges they face can be easier to manage if their families opt for professional at-home care. Winnipeg families can rely on expertly trained caregivers to keep their loved ones safe and comfortable while aging in place. For compassionate, reliable in-home care, trust the experienced professionals from Home Care Assistance. Reach out to one of our Care Managers today at (204) 489 6000 to schedule a free in-home consultation.